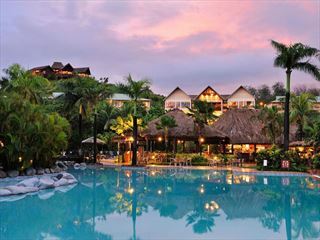 For a slice of paradise in a tropical setting, The Westin Denarau Island Resort & Spa is the place to be. 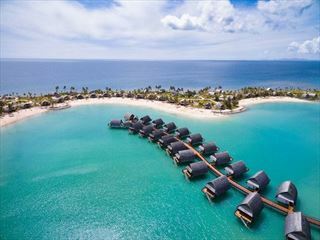 Nestled on the private archipelago of Denarau Island, only a short distance from the main island, travel here and you’ll be able to relax amidst swaying palm trees and the glittering South Pacific Ocean as you take advantage of the resort’s luxurious amenities. 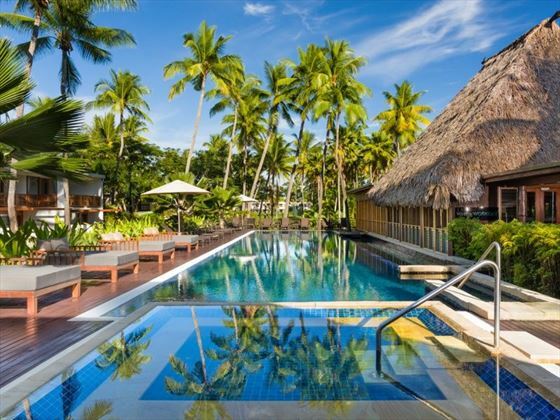 The resort is one of three within a luxury Fijian resort complex, offering numerous sparkling pools, plenty of entertainment, and 14 dining options using fresh, local flavours and ingredients. 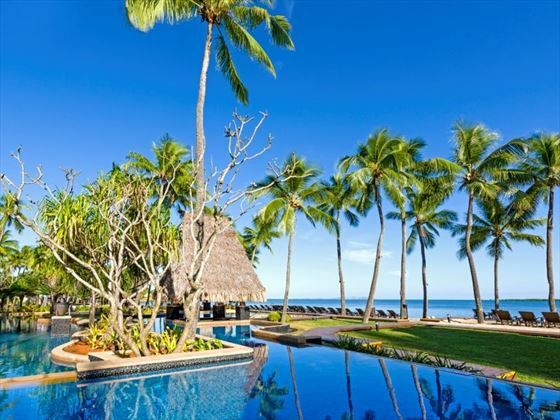 The architecture and interiors truly embody Fiji’s rich cultural heritage, taking inspiration from traditional villas and craftwork. The resort’s decadent Heavenly Spa by Westin will be sure to completely immerse guests in total serenity, offering treatments that spiritually heal the mind, body and soul. Afterwards, get into the party spirit and head to the Meke Lovo Cultural Show. Every Wednesday and Saturday, guests can enjoy delicious local cuisine cooked in an underground oven, as people firewalk and dance around them. 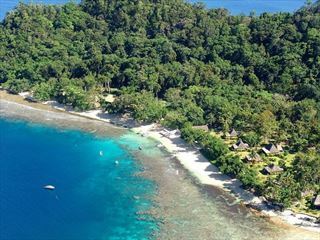 This beautiful resort is nestled on Denarau Island, a private archipelago attached to the main island of Viti Levu, with luscious tropical forests and wide stretches of golden sand beach. The location offers a quiet, tranquil ambience - the perfect atmosphere for relaxing and rejuvenating in the sun. If you need a break from sun soaking, the vibrant markets of Nadi are only a 15 minute drive away. 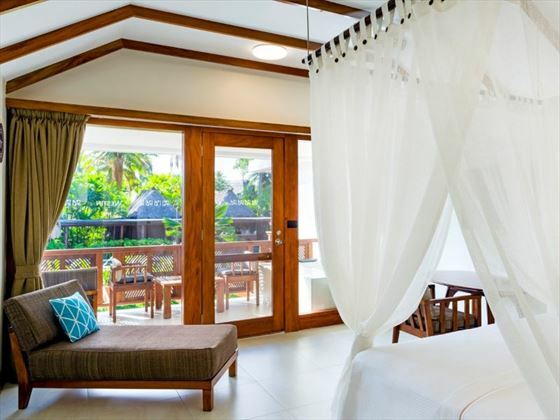 Ocean Breeze Room – Located in the room blocks lined by the Pacific Ocean, these 40sqm rooms embody modern luxury with Fijian influences. Sleeps a maximum of three adults, or two adults and two children. 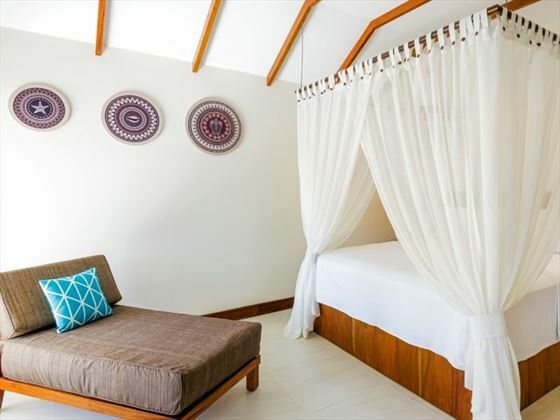 Ocean View Room – Sitting 50 metres from the waterfront, these 40sqm rooms have stunning views of the ocean, with touches of local Fijian craftwork. Ground floor rooms have direct access to the beach. Sleeps a maximum of three adults, or two adults and two children. Ocean Front Room – Facing the ocean, these 40sqm rooms have a contemporary flair, with direct access to the beach and surrounding gardens. Sleeps a maximum of three adults, or two adults and two children. 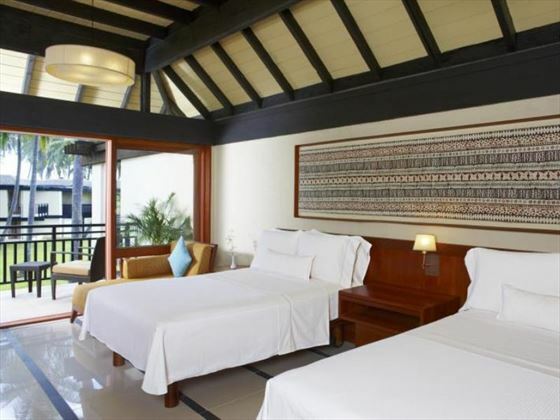 Ocean Front Suite – These 80sqm suites are inspired by authentic Fijian design. Featuring a private balcony or patio with gorgeous views, a surround system, and a kitchenette with microwave, fridge and dishwasher. Sleeps a maximum of four adults and two children. Western Renewal Spa Studios – Neighbouring the Heavenly Spa, these romantic 45-51sqm studios feature either a patio with a plunge pool, or a terrace with a spa bath. Sleeps a maximum of two adults. Western Renewal Spa Suite – Adjacent to the Heavenly Spa, these 80sqm suites are nestled on the upper floor, with spectacular views of the calm lap pool from its private terrace with outdoor spa bath. Featuring a lounge area, floor-to-ceiling windows, a wet bar and a dining table. Sleeps a maximum of two adults. 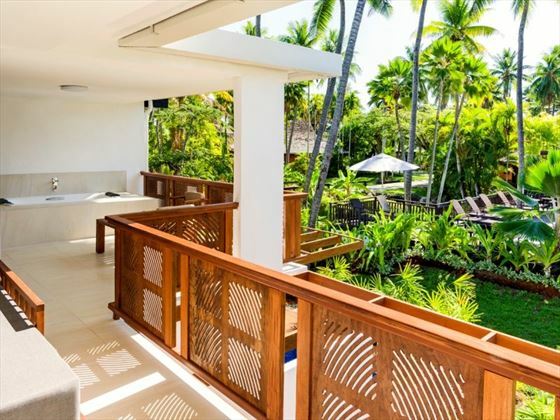 Regent and Royal Suite – Sophisticated 120sqm suites with a private balcony offering panoramic views of the gardens, beach and ocean. Featuring a separate bedroom with a free standing tub, a dining room for up to eight guests, and a kitchenette. Connecting rooms are available. Sleeps a maximum of two adults. Kitchen@Westin – The resort’s signature beachfront restaurant, serving premium steaks and seafood with the finest flavours. Open 11am to 10pm, with dinner from 6pm. Meke Lounge – An elegant venue perfect for sipping cocktails with a gorgeous view of the ocean. Open 11am to 10pm, with happy hour from 5pm to 6.30pm. 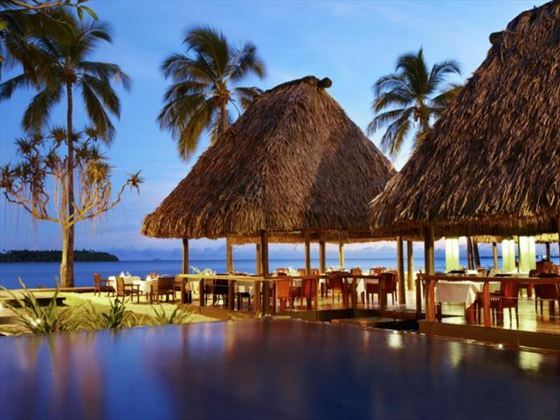 Coco Palms – Open every Wednesday and Saturday from 6pm to 9pm, this dining venue features the Meke Lovo Cultural Show – offering delicious local flavours and fantastic performances, including Meke dances and firewalking. Food is cooked in an underground hot rock oven. The Westin Bakery – A quaint café offering light snacks, pastries, coffees and teas. Open from 8am to 5pm. 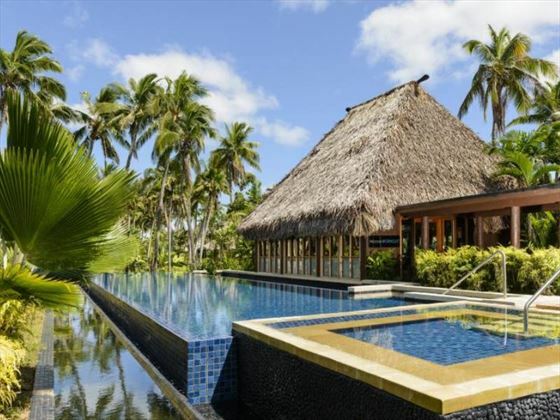 Fiji Premium Club House – Located at the Denarau Golf Club, offering delicious wood fired pizza and daily specials. Open from 7am to 9pm, with dinner served from 5pm. 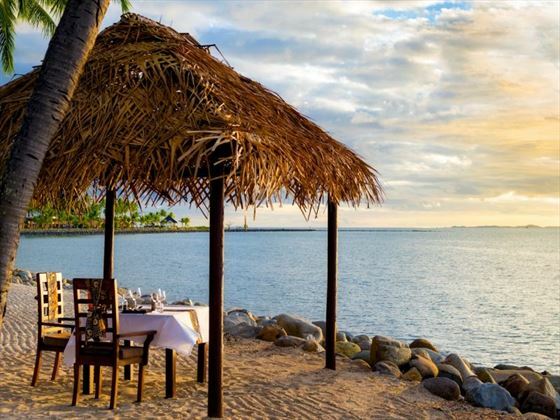 Flying Fish Fiji – A lovely waterfront dining venue, offering flavours from across the world. Open 11am to 10pm, with dinner served from 6pm. Ports O’Call Restaurant – A fine dining experience serving decadent, international cuisine. Open from 6pm to 10pm. Feast Restaurant – A fantastic buffet serving fresh, seasonal seafood. Open from 6.30am to 10am and from 6pm to 10pm. Chime Bar – A fun bar with live entertainment and tropical cocktails. Open from 5pm till late. The Pantry – Offering gourmet deli cuisine, including pastries, coffees and sandwiches. Open from 7am to 6pm. The Wet Edge – A vibrant swim-up bar, serving fruity cocktails and casual poolside meals. Open from 10am to 9pm. 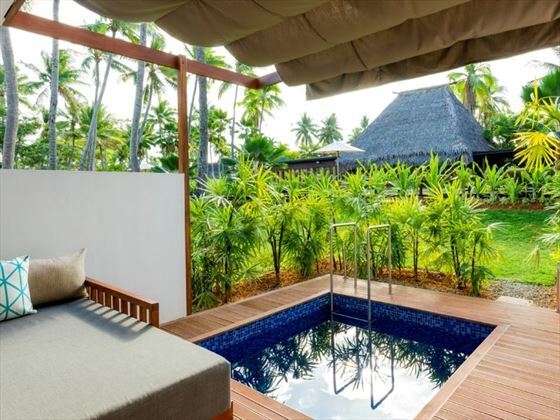 Heavenly Spa by Westin – Accessible to all guests staying in the resort complex, this relaxing retreat is nestled within 1,350sqm of beautiful gardens and has 10 open0air therapy rooms and two suites with a Fijian villa design. The treatments revolve around spiritual healing, with renewing body treatments influenced by the nature surrounding the spa. 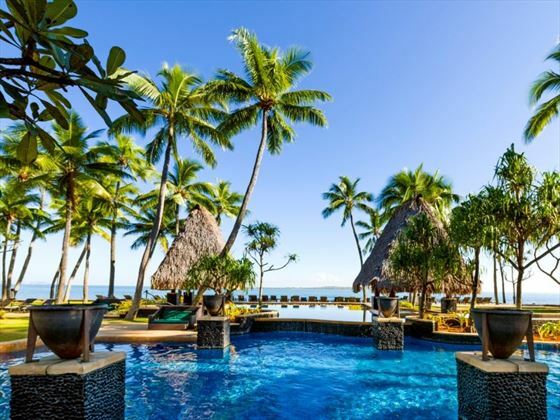 LaiLai Kids Club – a fantastic club in the Sheraton Fiji Resort, with a great daily programme of educational and engaging activities for kids, including Fijian language lessons, fish feeding and face painting. All at an additional price.